Abivin vRoute is a cloud-based supply chain management solution that plans optimal routes for delivery and service trucks and bikes. The dynamic route optimization software considers various constraints on orders, including time frames and order weight/volume, to deliver data-driven recommendations for drivers. The system is included with a fleet management system to keep track of vehicle locations and routing conditions. vRoute’s fey features include mobile capabilities, automated optimal routing, real-time dispatching, and an interactive dashboard. A web-based app is designed for managers, and an easy-to-use mobile app is designed for deliverymen. 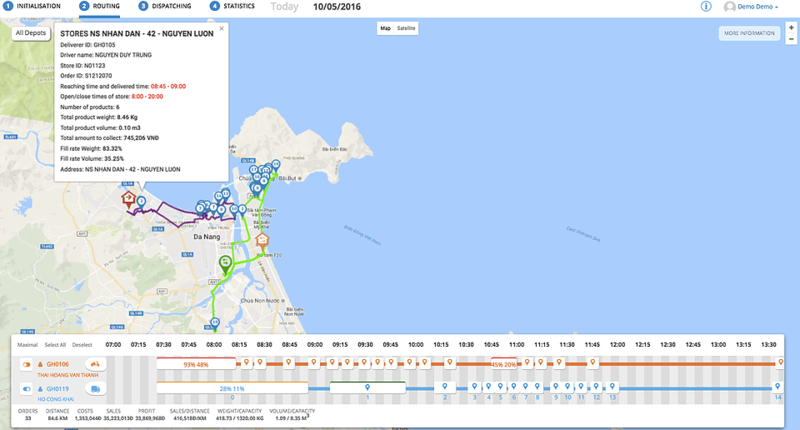 The vRoute algorithm handles multiple business constraints at once, including bike delivery, customer locations, load capacities, time window, and driving preferences. vRoute allows users to monitor real-time delivery progress anywhere, anytime, re-route automatically when there is a change request. The interactive dashboard includes detailed reports about delivery progress, deliverymen’s performance, and customers’ stores. vRoute’s includes cost saving measures, complete integrations, comprehensive solutions, and localized features. Users have reported saving 40 percent on logistics costs of labor and fuels. vRoute can be integrated with any of existing fleet management systems such as ERP, TMS, WMS, and DMS. Users can optimize routes with one click, geo-track fleets in real-time, and digitize the end-to-end delivery process. Localized features allow users to resolve all business constraints uniquely for ASEAN markets, such as bike and truck delivery, store locations, or time windows. Not sure if vRoute is right for you? Use our Product Selection Tool to compare other supply chain management solutions. Have questions? Call one of our unbiased Technology Advisors for a free consultation. Learn everything you need to know about Abivin vRoute. Our experts will reach out to you shortly.